Meet Chris Gibbany from Harrison, Arkansas. 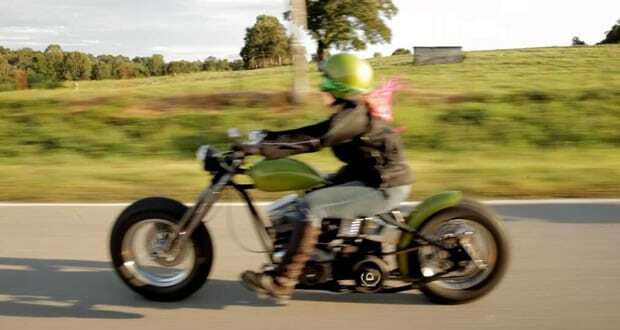 Chris builds hot rods and Harleys, and she’s our Featured Woman Motorcyclist of the Month. 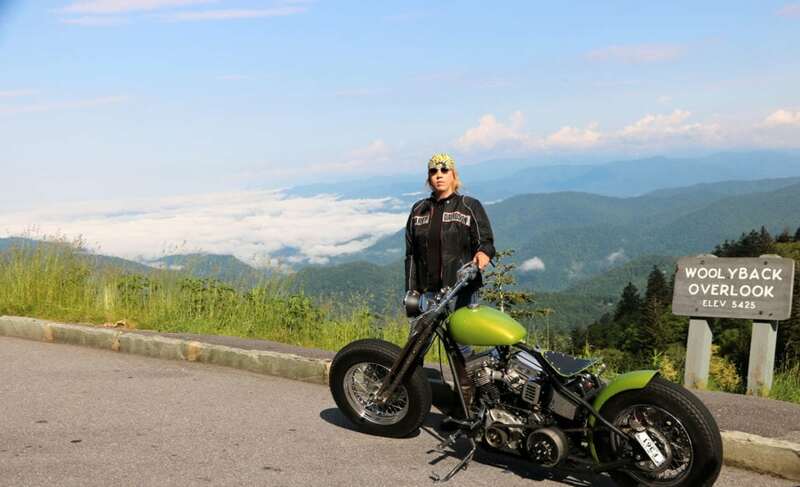 Chris is happily living a life that revolves around her custom vehicle builds and mods, including a 1956 Panhead, as well as two early Knuckleheads. Her daily driver is a flat black 1973 Dodge Rallye Challenger, and she’s working on a 1968 Charger with a four-speed and big block. She’s a photojournalist, editor of Renegade Magazine, a former drag racer, wedding photographer, hedgehog breeder, and extreme couponer. We sat down with Chris to talk about her latest custom motorcycle build. YouMotorcycle: What inspired you with this build? Chris: I love the look of the Zero Engineering bikes that were built by Shinya Kimura and I wanted to build a bike that had his influences but yet was still different enough to not be a copy-cat. I kept my bike in raw metal for a long time but eventually painted it the original color that I had in mind, which is the green you see on it. I incorporated several of the same parts (seat pan, grips, mirror, broomstick bars and taillight/license bracket) and beefy look as on my first build, a 1981 Ironhead called Iron Man. YouMotorcycle: How did you end up with this bike? Chris: I bought the engine in 2009. After I told a guy about all of my cars, drag racing, and the Ironheads that I owned (at the time), he told me about this engine. I went over the next night and got it. My plans for this bike was to build my dream machine; that this was going to be the last bike I built so therefore I should build it exactly how I wanted it. My intent was also to build a bike that blended vintage beauty with modern technology. YouMotorcycle: How long did the build end up taking? 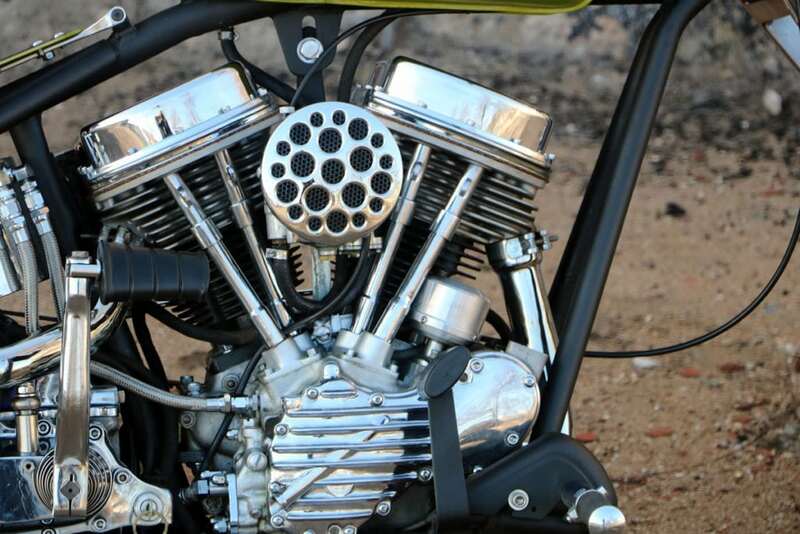 Chris: I designed my Panhead that I call “Panacea” from start to finish and my husband and I built it in a backyard shed. Since I started with just a motor, wanted everything to be “just right” and had practically no money to work with, the bike took me six years to build. YouMotorcycle: So what was the process? Chris: The first thing I did was buy a Chica gooseneck frame. At the time I didn’t know a good fabricator/welder, so I went ahead and splurged on the frame even though it had larger tubing and was actually set up to run a larger 180 back tire. In the end it added to the beefy appearance I was going for, as did adding the Avon MK II double 16” tires that I put on both front and rear. 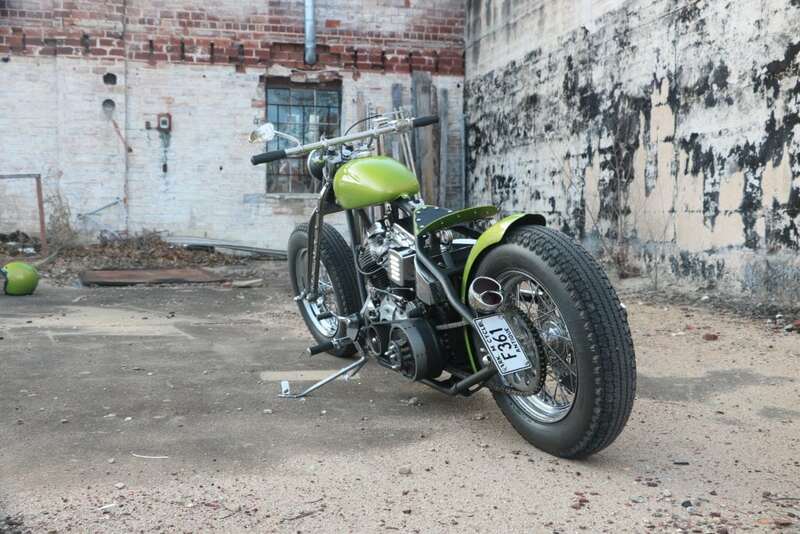 YouMotorcycle: Did that Panhead motor get some love? Chris: Yes. I was originally going to leave the Pan kick-start only, but I have a bad knee so I opted to go ahead and purchase a Tech Cycle starter kit. Since this was my “dream bike”, I also added a Baker Drivetrain N-1 shift drum that puts neutral on the bottom (or the top, depending on which way you install it). YouMotorcycle: I heard you had to sell a lot of guns to get this bike just how you wanted it. Chris: I saw a photo of an awesome looking springer on the internet and did a bunch of research until I found out what it was. I then contacted George Counes, owner of Spartan Frameworks and gave him the dimensions to make me a springer. When I found out he didn’t take credit cards, I had to sell all of my guns that winter to pay for it. It arrived the day after Christmas and it was the best gift I have ever given myself. YouMotorcycle: What are some of your other favorite modifications? Chris: I ended up running a 1 ½” open belt primary instead of using the original tin primary and I absolutely love it! The frame has a 3” gooseneck on it and after building the bike I wished it had a longer gooseneck on it. I found an awesome welder, John Hayden and had him gooseneck my Jammer frame for my ’39 Knucklehead seven inches. He was apprehensive about stretching it that much as he didn’t think it would come out right, but after completing it and seeing my engine sitting in the frame, he had to admit that it totally rocked! YouMotorcycle: As a photographer, you must love the work. Chris: I love the way the build all comes together and totally encompasses the idea I was going for. I love the bike from all angles and I believe a bike has to look correct from the left side as well as the right side. Most people only photograph and concentrate on the right side. YouMotorcycle: The power of coupons… 3, 2, 1, go! Chris: I built this bike mostly by using coupons. I would get tons of product for free by way of coupons and then I would turn around a sell a lot of it (what I didn’t donate). Since I was couponing full time, I never had to use any real money for anything, even my gas and eating out was paid for via coupons by getting overage (money over the value of the coupon) and then grabbing gas and restaurant gift cards at the checkout lines. I would have people come over for my coupon parties while my Panhead was mocked up in the middle of the living room. I slept beside it for three years. Chris: My right arm is dedicated to my Panhead. I had my artist, Dessa Blackthorn, tattoo images of my Pan; it’s motor, four-speed gears and license plate for my half-sleeve. Our motto is “Old Iron Never Dies” so that is tattooed on me as well. YouMotorcycle: Any other motorcycle tattoos? Chris: All of my tattoos are car or bike related, as my left arm is dedicated to my ’39 Knuckle, my left shoulder to my Mopars, and my right shoulder to my ’37 Knuckle. I also have the ’81 Corvette flags on my lower back; my first Corvette that I owned for 13 years. Dessa Blackthorn has done all of my work EXCEPT the Corvette flags, BUT, ironically, she bought the Corvette from me when I switched to Mopars! YouMotorcycle: You’ve been riding since you were 16, and you have a strong history of motorcycling both internationally and within your local community. Can you tell us a little about that. 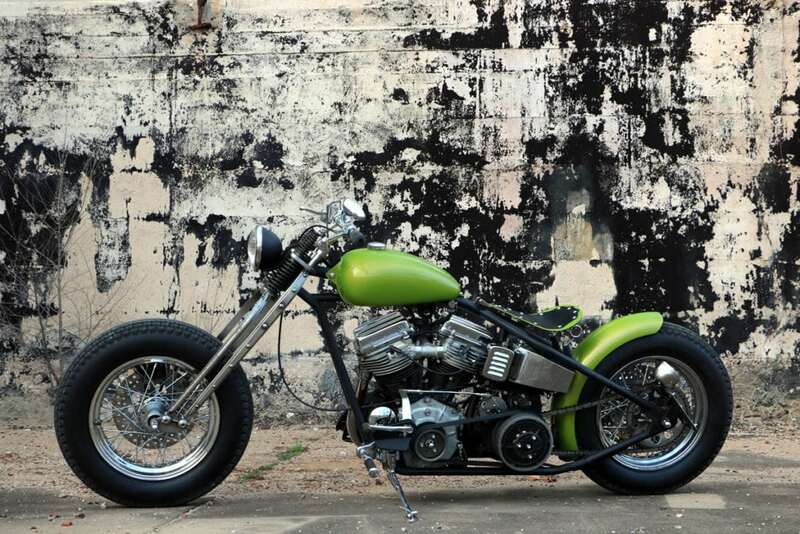 Chris: My Panhead and my ’81 Ironhead have been featured in magazines throughout the world; Spain, France, Germany, Australia, the UK as well as many American magazines such as American Iron, American Iron Garage, The Horse Backstreet Choppers, and I am in Easyriders on a monthly basis. Last year I hosted the Distinguished Gentleman’s Ride in my town and was awarded highest local fundraiser; I am the Official Ambassador for motorcycle tourism in the entire state of Arkansas; my photos were used in the Sturgis Museum for “My First Ride” mural in 2015, and I am the Global Women Who Ride Arkansas Representative. YouMotorcycle: What’s your next build going to be? Chris: I am almost done with my 1939 Knucklehead build and my special project this year is my 1937 Knucklehead that I have dubbed “Redemption”. I bought it with proceeds from my late mother’s estate. She was a narcissist and I am building this bike to raise awareness to the effects that narcissistic abuse has on its victims. Many people are not aware of what this is or how to get away from it. I have dealt with it my entire life, from my mother, to ex-bosses, ex-boyfriends, etc. I want to let people know that you CAN escape it, and the key to it is to first be aware of what is going on. I would like to thank World Narcissistic Abuse Awareness Day for featuring me and my story last month in their Spotlight series. YouMotorcycle: Wanna give a shout out to anyone? Chris: I especially want to thank my husband Gabe who helps me with my builds and supports everything that I love. It is awesome to have someone who understands my love of everything gasoline powered! I want to thank all of my sponsors. I won the Garage Girls Ultimate Biker Makeover in 2014 and several of them stepped up to sponsor me when I was getting ready to ride my Panhead from Arkansas to North Carolina last year. I have acquired national sponsorship once again with the building of “Redemption” and would like to thank Spectro Oils, Avon Tyres, Baker Drivetrain, Star brite, and Viking Cycle, for the products and gear that are helping me to build the ’37 Knucklehead. I also want to thank Garage Girls, Russ Brown Motorcycle Attorneys, Scharf at Renegade Magazine, and Throttle Gals Magazine for letting me write about my life and projects, as well as the fabricating skills of John Hayden Welding and Ryan Reeves at Hog Creek Machine and Fab who help make parts for my builds. I would also like to thank every magazine that has ever published me, my bikes or my cars as well as every blog or website out there that has featured me. YouMotorcycle: We’re lucky to have ya, thank you, Chris! Where can our readers find or follow you? Chris: Not only do I not have social media, but I also live without television, microwave, clothes dryer, etc. Besides writing for Renegade Magazine, I also give updates on Garage Girls website; I am a contributor on Russ Brown Motorcycle Attorneys website and I contribute to Throttle Gals Magazine. I have a blog that I update occasionally called Amazing Cheap Life because I live with very little money but still have an amazing time with amazing toys! I believe if you have your priorities straight, anything is possible. My passion for vintage Harleys and old Mopars drives me to be dedicated to inspiring others. I believe that anyone can improve their circumstances if they are motivated to do so. I LOVE to promote and I support those who support me. My husband and I are on a mission to make sure that OLD IRON NEVER DIES! Good things happen to good people. I am here to prove you can be cheap and live an amazing life! Next: Is Your City Sick of Cafe Racers?